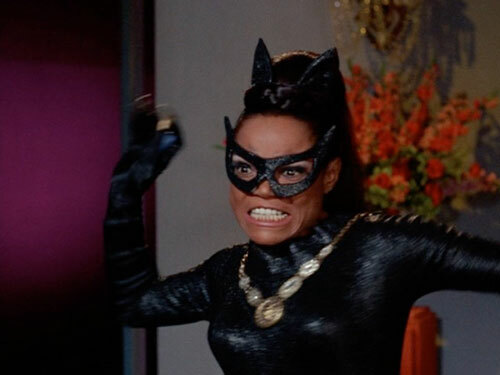 With Julie Newmar off (reportedly) filming Mackenna's Gold, Eartha Kitt was recruited to play Catwoman in season three. In this episode, we dig into her first appearance, Catwoman's Dressed to Kill, an episode that seems to exhibit a lot of misogyny — but is that primarily on the part of writer Stanley Ralph Ross, or on the part of Batman himself? Meanwhile, of course, the casting of an African-American Catwoman apparently led to the end of the Catwoman - Batman romantic tension, and in the Bat Research Lab, we take a look at an interracial kiss that was broadcast on American TV just three days before this episode, as well as a 1967 sitcom that clearly made a reference to Batman '66. 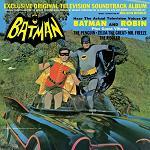 Plus, the Boss Martians' version of the Batman theme, another Camping Trip, and your mail! Regarding the relationship: Batman tricked Catwoman one too many times in "Catwoman Goes to College/Batman Displays His Knowledge" that she was no longer romantically interested in him and even tried to kill him with poison perfume and seduction. Once she revealed it to a naturally prepared Batman; well, let's just say that schtick would never work again with him. So it makes sense that Eartha's Catwoman would be channeling early Julie's Catwoman; more like from the awesome first season episodes. Another terrific show, guys! I intend to give a more thorough review later. As for now, your point, Tim, is well-taken about the poor sound quality of the scene with Catwoman posing as the Queen of Belgravia. I wonder if it was supposed to be made to sound muffled in the editing room when Eartha was concealing her face, but the level wasn't changed when she revealed whom she really was. As for the line, I think she calls the two reps of the GCPD 'timorous tabbies,' which would be in keeping with the Cat theme. And I think this whole thing about Julie filming a movie, has been debunked several times on the board, although in what threads I'm uncertain. IMDb gives a filming date for the movie as 16 May 1967. What was the filming date for Eartha's first episode? I seem to recall a newspaper article announcing her casting. Not sure, but I think Bob Furmanek had info on all this? Might be my old brain having false memories? One bio point about Karen Huston (Queen Bess). Her husband, John Ericson was a semi-big name in TV from the 50s to 70s whose most famous role was Anne Francis's co-star/partner in "Honey West" (1965-66) which was the first American network TV show to give us a strong, action-oriented female lead. (Anne Francis would have certainly been worthy of villainess material). Also, when Batman makes the point about how in the event of a war with Belgravia, America would be responsible for rebuilding their economy etc. was a line that evoked the novel/movie "The Mouse That Roared" which is about a country that declares war on the US solely so they can lose and benefit from American money to help them rebuild! The "Movin' With Nancy" special which was discussed offered a reminder to me of how Nancy Sinatra would have been ideal casting for the series in some kind of role that tapped into the hippie movement (easy to see her as a bigger name for a Princess Primrose type part if not an outright villainess). And Nancy did have some TV guest credentials by that point, including "Man From UNCLE". And regarding "He And She", it shouldn't be overlooked that Richard Benjamin and Paula Prentiss were (and still are!) husband and wife! Jack Cassidy's casting as a TV superhero (great catch on the "Oscar North" name. I hadn't pieced that as a send-up of Adam's name until I heard this!) was somewhat appropriate because just before "He And She" in the 1966-67 season he had been the top-billed star of the Broadway musical "It's A Bird, It's A Plane, It's Superman" which heavily cashed in on the Batman phenom at that point by presenting sets with oversized comic book style backdrops and captions in the Batman style. Cassidy played an arrogant newspaper columnist for the Daily Planet who hates Superman to the point where he joins forces with a mad scientist trying to bring the Man of Steel down. The musical only lasted four months and wasn't a success (although some elements later influenced the Christopher Reeve movie, in particular the depiction of Clark Kent as a bumbling Harold Lloyd type. David and Leslie Newman wrote the script for the musical and were later among the writers on the Superman screenplay) But casting Cassidy in this role just after he'd been in the Superman musical was probably no coincidence! 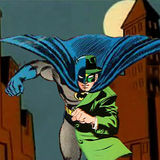 (Cassidy I think would have been the ideal replacement Riddler if Gorshin never came back). Speaking of Nancy Sinatra I just looked her up on IMDB to check something I heard about her. Her mother's name was also Nancy, but they have different middle names. If they had also shared their middle names too the "These Boots are Made for Walkin'" singer would have been known as Nancy Sinatra Jr.
Messrs Tim and Paul, if you want to know what the two words Catwoman spoke that you could not make out, they would likely show up on the subtitles. I always watch with the subtitles on since my English comprehension is not always the best. I would listen for you but my BR's are back in the US. Batman and Robin-caped crusaders at night! Always wish Stanley Ralph Ross was still alive, so that we could clarify some rumors about these Earth Kitt Catwoman episodes. And I wish even more that I could remember where I first heard some stories. Wonder what the first drafts were like before the networks forced any changes? Eartha had back problems in September 1967, which supposedly delayed filming one of her episodes--noted in the Dozier letters. Given that Dozier was so concerned about getting the show into syndication with the third season (not to mention being born in 1908), I'm guessing he didn't want to rock the boat concerning interracial kissing. SRR wasn't exactly known for his credibility when it came to shop talk, usually preferring a good tale over the actual truth. Similar to third season's Joker wanting to be king of the surf, and Louie's similarly inexplicable interests among the flower children, the new Catwoman is obsessed with plans as ambitious as a teenage girl wanting to be prom queen. This is no longer the calculating Catwoman, but one who is just there in name only, which could not have been the outcome desired by Dozier as he introduced someone trying to follow in Newmar's footsteps. It was the same situation with Mr. 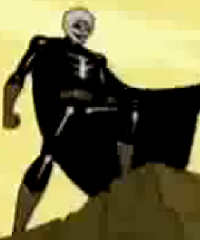 Freeze: the first to take on the role was the best--not because Sanders happened to be the first, but due to his taking something never brought before a camera and shaping it to his specific ability, so the villain only "breathed" because of the 1st actor's interpretation and understanding of how the TV character was intended to come alive. Remove that, and its just replacements like Otto, Wallach, or Kitt...though I give Astin a pass only because he's such a joy to watch no matter the role. For the rest, they were forever locked in trying to "turn up" their performances mode, almost as if they believed that would make the role their own and/or wipe the 1st actor's version or presence from memory. About Richard Benjamin--while Jack Cassidy portrayed a West-based character on He and She, Richard Benjamin would go on to co-star with Adam in 1971's The Marriage of a Young Stockbroker, a comedy about infidelity in two bad marriages, with West cast as one of the husbands. 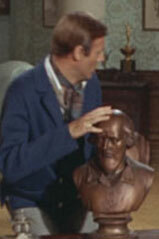 The film was a 20th Century Fox production, with a screenplay co-written by none other than Lorenzo Semple, Jr. I wonder if Adam landed the role because he still had a contract with Fox, or did Semple toss a Bat-bone to Adam? More on Benjamin: before he nearly committed career suicide with the 1977 TV series Quark, earlier in the decade, he delivered a memorable performance as sensitive "regular guy" turned hunted tourist Peter Martin in the 1973 sci-fi thriller Westworld. A fun instalment of the podcast. Thanks guys. Funny that you mentioned the Huntress as a potential winner of a previous Batty Award. Not only Earth-2 Batman's daughter, but Catwoman's as well! Re Catwoman's hair-raising bomb - it supposedly "ruined their hair forever" and yet, later in the episode, we see more perfectly-coiffed women of Gotham City. Some of them needed to still have raised hair, if the bomb had "ruined their hair forever". Thanks. Several people have pointed this out -- via e-mail as well as here. I had completely spaced off that there were subtitles! It is indeed "timorous tabbies" -- although one e-mailer reports that, if you watch the episode on Vudu and turn on their subtitles, you get, somewhat nonsensically, “timorous tidies”!